This is part 3 of the article How to Run Faster… at any Age as we start going into Technical Competency and Sprinting Efficiency. Part 2 talked about the importance of coordination. If I had to name a couple of jargons related to sprinting and how to sprint faster, it would be “dorsiflexion”, “triple extension” and “hip height” (just to name a few… there are hundreds of cues… and I will cover them all eventually). I’ll start with “hip height”. You’ve heard the expression “STAY TALL” by so many coaches. Hip height is good for several reasons. We’ll reference the image below, created by Derek Hansen. 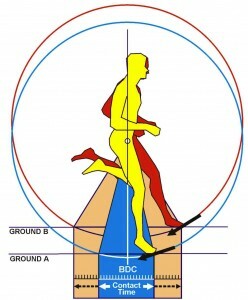 The red runner has the lower hip height, whereas the yellow runner has a higher and better hip height. Increased hip height means shorter ground contact times. I’ve covered the topic of ground contact in several past articles. Increasing hip height increases flight time and more distance covered because the increased hip height provides a “toe off” occurring closer to the center of mass location. See Jon Goodwin article and video on Why Usain Bolt Run So Fast. A better positioning in toe off means greater forces applied, which means a greater max velocity. Increased hip height means less energy is required to stay above the center of mass. Using assisted devices for overspeed training (i.e. harness and bungee cord, or training partner) will actually reduce hip height as the artificial forward force will pull your COM into the ground, thus reducing hip height. A high hip height allows for the follow through of the back leg and foot to pass under the hips, and drive the knee in a powerful position to drive down and back. Some coaches like Latif Thomas recommend punching the ground in a powerful yet forceful way to increase speed.Remember the pendulum in the Grandfather clock? It’s not the weight that affects the oscillation, it’s the length of the string. Shorter strings produced faster frequencies. Tempo runs (i.e. 2 sets if 10x100m at 70%) are good to work increasing hip height by simply being aware of it. And having a coach yell at you to “stay tall”. However, using spikes on a flat grass surface (i.e. my personal recommended training for Masters) has its limits, and only recommended up to a certain speed, say 90%. Stable smooth surfaces are required. The instability of the ground makes it impossible (if not dangerous) to get the hip height you need to go to max velocity. As well, I would need another article to explain the complexities of Sprinting and Elastic Strength that talks about muscle stiffness, loading/unloading of the muscles and tendons, and explosive power. For more information, see the 30 minute video from Derek on Hip Height & Running Mechanics (or link to http://www.strengthpowerspeed.com/ page) as he discusses more about Hip height and its implications for running speed, running economy, movement velocity and injury prevention.